LAS VEGAS, NV -- (MARKET WIRE) -- August 20, 2006 -- It looks so simple, so elegant. 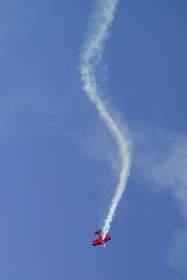 The red, white and blue biplane flies in a loop against the clear morning sky. Then, the biplane heads for the ground, pulling parallel yards above the surface. The speed, which can reach 212 mph, and the feeling of danger are evident. Eventually, the 1,300-pound plane lands and, as it taxis, it looks so small the wonder is that it flies. It's only six and a half feet high. Out of the plane steps Ed Hamill, a full-time professional air show pilot. This is a normal practice run, an essential part of keeping physically and mentally in shape to withstand the G-forces and disorientation of hanging upside down and spinning in decreasing circles. Hamill's performance includes the "daring antics" of the barnstormers of the '20s, who owed their existence to WWI training and a surplus of CurtisJN-4 "Jenny" biplanes, the craft of choice. Next, he illustrates the flying competitions of the '50s and, finally, the tightly choreographed routines of today's sky dancers. You can see the Living the Dream show, presented by the Air Force Reserve, at the 2006 Indianapolis Air Show, Mt. Comfort Airport, August 26 and 27. "My message throughout the show is to set goals, work hard and never give up," said Hamill, who is also an F-16 fighter jet instructor for the Air Force Reserve. "This is a fantastic part-time job because I can serve my country and still be an aerobatic pilot, which is my dream." Hamill's biplane is patterned after one built 50 years ago by legendary designer Curtis Pitts. The wingspan is only 20 feet and the wings are covered in Dacron cloth. This is pure flying -- no computer, no auto-pilot, just a stick and rudder and the plane does exactly what the pilot tells it to do. Ed Hamill and his Dream Machine are proudly supported by the Air Force Reserve, composed of more than 70,000 men and women. Although members of the Air Force Reserve serve part-time, they perform approximately 30 percent of the work of U.S. Air Force. A large number of civilian jobs in America exist in the Air Force Reserve, where reservists can continue their careers while serving their country. The Air Force Reserve is a team of people who are stationed locally, but serve globally.